BigCommerce users face the problem of viewing aggregated data in reports and aren’t able to get insights from individual payment gateways. But now, with this exhaustive reporting from Putler, it won’t be the same anymore. Why in-depth reporting for BigCommerce is a must? The traditional BigCommerce reports will provide you only combined data for multiple payment gateways that too for your single store. Hence, for a better aggregated view of multiple stores as well as data from individual platforms at a single place, you need a better solution. 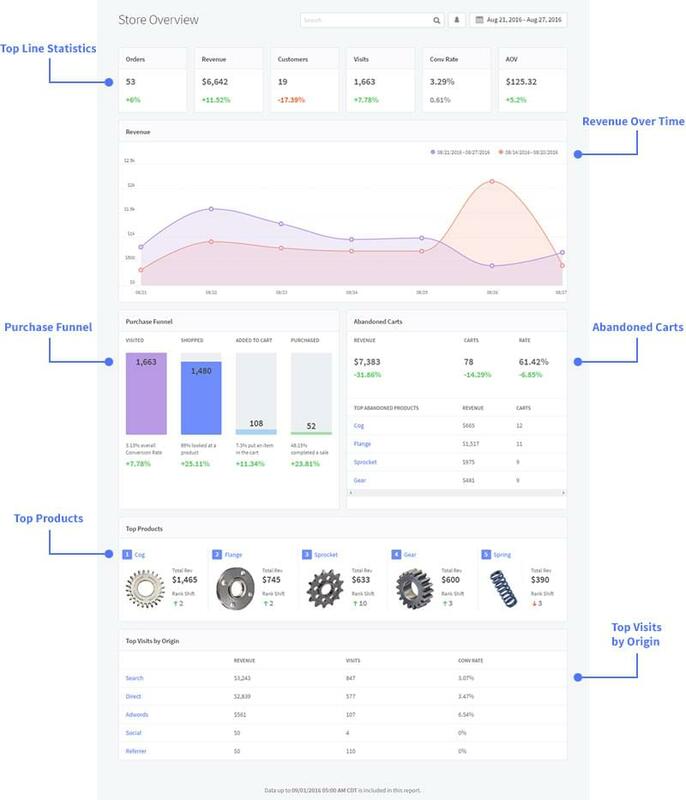 BigCommerce provides you a total of 11 Ecommerce Analytics reports for your BigCommerce store. Analysing your sales funnel gives you data on the number of visitors who gets converted at each stage and how many fall-off at each stage. You also get the count of how many carts get abandoned. This graph gives you a visual representation of the number of abandoned carts versus the number of abandoned carts that were recovered. This is only if you have enabled the Abandoned Cart Saver feature. Here, you can select a particular date range and compare revenue performance. Same with orders. Keep a track on your best and worst selling products, fastest and slowest moving products, etc. New vs returning customers, customer profiles – what product they purchase, their name, email, address, cohort analysis, etc. All the stats you see in your BigCommerce reports are for your single store / website. For multiple stores, you need to connect them individually and view separate reports. Since, you can view data only for a single store and that store has multiple payment gateways to it, you will see aggregated data in the reports and not individual data for each of your payment gateway. Example – If you want to see customers paying money via PayPal & Stripe separately, you won’t be able to do so. You can only set different currency to appear on your store for customers. But if you have multiple BigCommerce stores accepting different currencies, the individual transactions won’t get converted into the desired currency. BigCommerce reports also fails to provide metrics like MRR, LTV, ARPU, etc. for subscription businesses. In-spite of some good products and customer insights, businesses today require additional unique insights that are not covered by BigCommerce. Here’s those insights businesses need today. 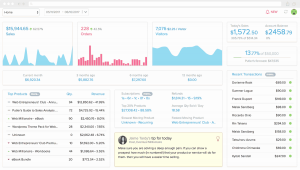 Is Putler a better BigCommerce reporting & analytics alternative? For first timers, Putler is a complete analytics and reporting solution for your business. Be it any store builder like BigCommerce, Shopify, WooCommerce or any payment gateway – PayPal, Stripe, etc. Putler gives you meaningful insights for your business. It’s unique feature of consolidation, deduping and generating insights has made it a crowd favorite. What BigCommerce users love about Putler? If you have a single BigCommerce store or multiple stores (BigCommerce, Shopify, etc.) ; no matter how many payment gateways you use, you can connect any number of data sources to Putler and get insights for your business. Unlike BigCommerce where you aggregated reports for your store, Putler gives you aggregated as well as individual data for each of your store / payment gateway you connect to Putler. Get to know your different 11 customer segments – loyal customers, customers on the verge of churn, lost customers and more. Know how much each customer is willing to spend, their complete details – name, email, address, and more. For businesses into subscriptions, Putler brings up all the useful metrics like monthly recurring revenue (MRR), customer lifetime value (LTV), average revenue per user (ARPU) and others. You can even bring your Google Analytics data to Putler and get your website performance at a glance – top acquisition channels, top landing pages, bounce rate and more. Along with best and worst sellers, fast and slow moving products, you can keep a track on your product leaderboard, product vise sales and refunds, etc. Using Putler, you can manage your subscriptions as well as issue refund directly to your customers. BigCommerce is a strong platform and so it’s reporting. If you just need to monitor your data and are satisfied with traditional BigCommerce reports, you can stick with it. If you want to grow your business and need advanced reporting unique insights, Putler is the best choice for you.